Have you heard from all these other bloggers about how Pinterest has dramatically increased their traffic? You know you need to be on Pinterest but you either don’t have the time or just don’t know where to start. Well today I want to show you how I use Tailwind to speed up and schedule Pinterest quickly and why you should too. Make sure you Pin it and SAVE this post for later if you don’t have time now. 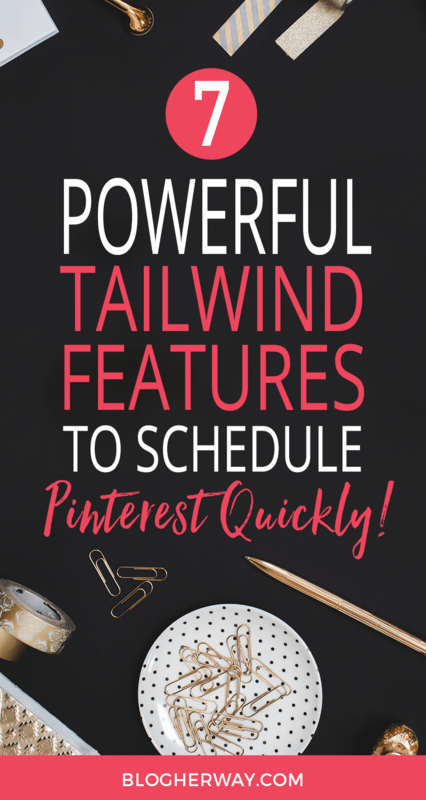 First off, Tailwind is an approved tool by Pinterest that allows you to schedule out your pins ahead of time so you don’t have to constantly be on the platform. 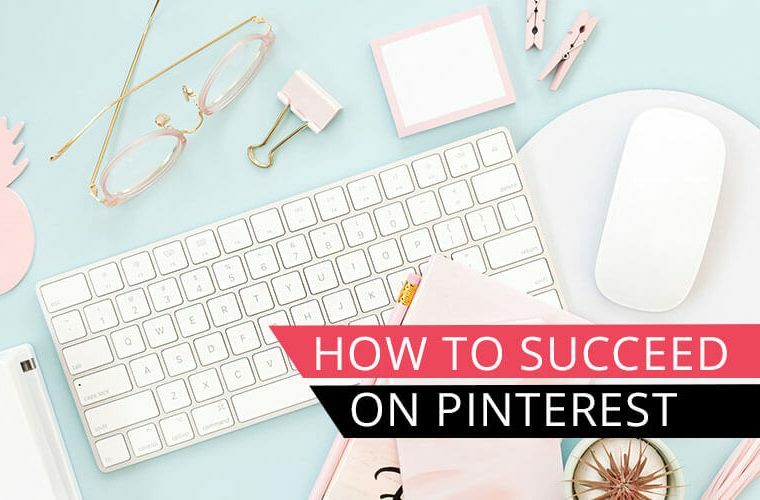 Although Pinterest is important you generally want to spend more of your time on creating content that will make you money versus spending time on tasks like scheduling out your social media. Today, I want to tell you about 7 specific features that Tailwind has that can significantly reduce the amount of time you spend scheduling Pinterest. 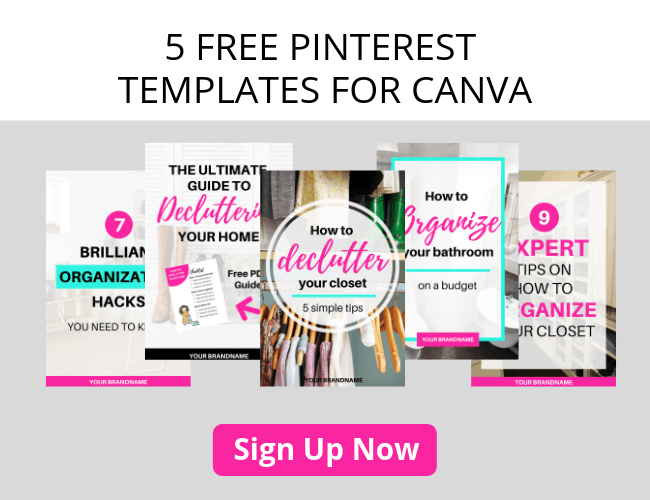 Before we go any further are you unsure if a Pinterest scheduler is right for you? That’s ok. There is mixed opinion about manual pinning versus scheduling pins and whether you get better results. Honestly for me it all comes down to time. Manual pinning requires more time and energy which I just don’t have. 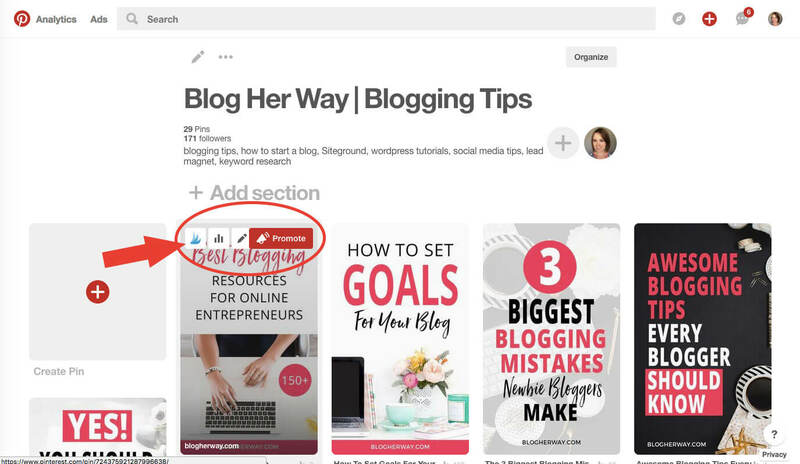 If you think you want to try your hand at manual pinning then Pinteresting Strategies is a good read. Carly from Mommy On Purpose is all about manual pinning. This is a great read for anyone who wants to learn more about the Pinterest platform and how it works. 1. Set up Tailwind’s SMART schedule to make sure your pins go out at optimal times. With Tailwind’s SMART schedule you will choose specific times throughout the day you want your pins to go out and it will reoccur on a weekly basis. When you go to schedule a pin you can either choose a specific time or send it to your queue where it will be added to the next available time slot. When you create your schedule initially Tailwind will suggest some “smart” times based on when people interact with your content. The more you work with tailwind and come back to your schedule they will suggest additional smart times as they get more data related to your account and when people are interacting with your pins. Board lists are a great feature when it comes to scheduling your own content. Think about your blog and the different categories you blog about. 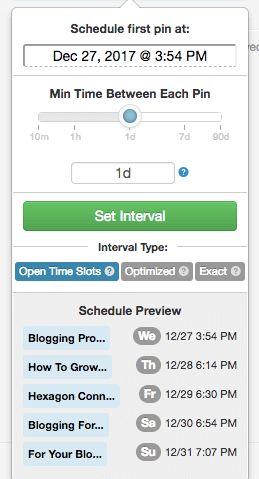 When you go to schedule a new pin you want a quick way to schedule it to all relevant personal and group boards. 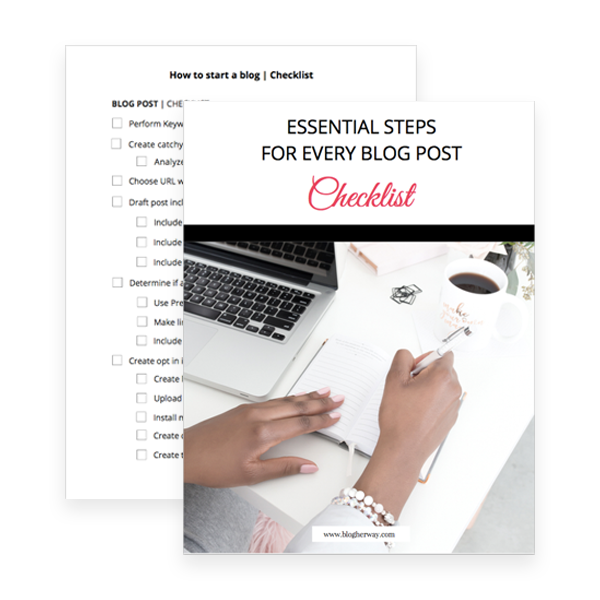 Use Tailwind’s board lists to create a board list for each category of your blog. You can get creative with this and how it will best fit your content. I created a board list for each category that included my boards and group boards. Next, I have a dedicated board list for just group boards. When you go to schedule one of your pins you will choose the board list you want. Tailwind allows you to select interval scheduling and you can choose the time interval for how far apart you want that particular pin to be scheduled to the various boards on the board list. That way the pin will not get scheduled to the different boards all at once. Special note: The order you list the boards is the order in which the pin will be scheduled. Do you want to schedule to all personal boards or to group boards first? Maybe intermix them? The choice is yours, but Tailwind has a great feature that gives you insight on the performance of each of your boards, which brings me to the next awesome tailwind feature board insights and pin inspector. Tailwind has an analytics feature called board insights that gives you data about when the last time a board was pinned to, the engagement score and vitality score. I will quickly break down what each of these terms mean. Virality score: This number is determined by the total number of repins divided by the total number of pins on that board. How viral our your pins? The higher the number the bigger ratio of shares you have to pins. Engagement score: This value takes the virality score (repins / pins) and then divides it by the number of followers you have. How engaged is your audience with your content? The higher the value the more engagement you are getting with your content from your followers. When setting up your board lists you can choose the order in which you list the boards. 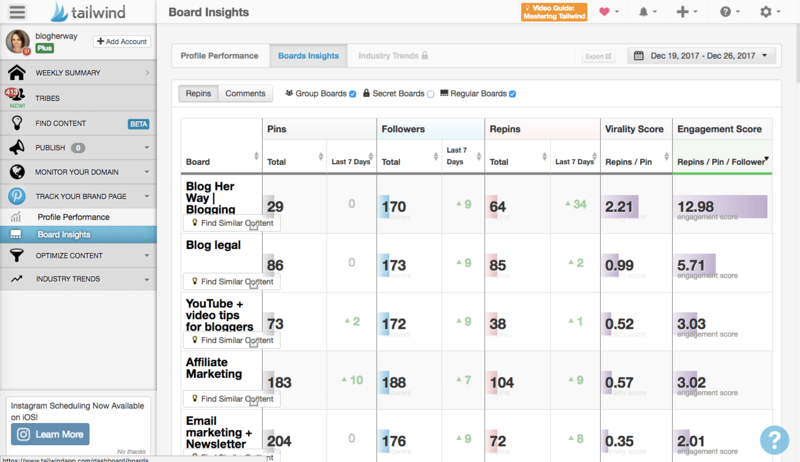 You can choose to list your boards in order of increasing virality/engagement or intermix them. Which is better? That is up to you and your Pinterest account. 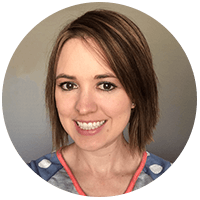 Kate Ahl from Simple Pin Media has a great podcast episode about Pinterest strategy vs tactics. When we consider the strategy of it you want to regularly pin your content to your personal boards and group boards to get your content seen by more people. 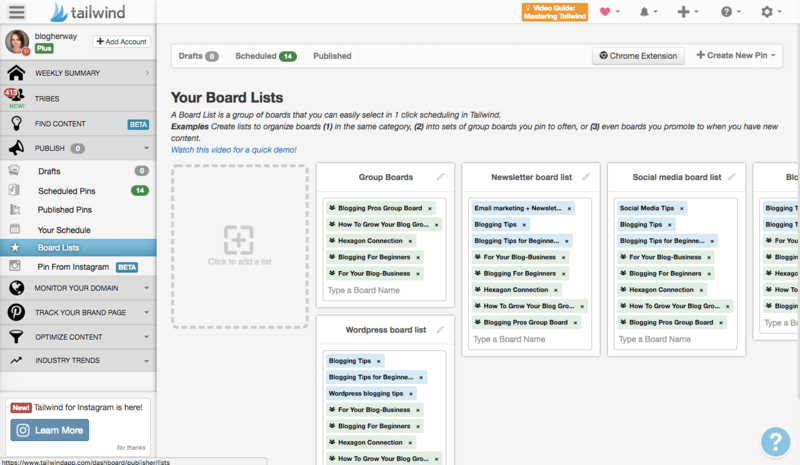 Board list is a tool that allows you to easily pin your content quickly to your personal and group boards. Deciding on what order you want to list your boards based on virality/engagement is a tactic, which you have to try out and test to determine which works the best for your account. In my case I schedule it to my personal boards first and then to my group boards, but you may find that a different tactic works better for you. Finally, board insights gives you information about how long ago a pin was saved to a board. In the pin column click on last seven days to show in ascending order with the lowest number shown first. Make a note of the boards that have not been pinned to in the last week. This way when you go to schedule other people’s content you will make sure you find pins for these boards to keep all of your boards active. 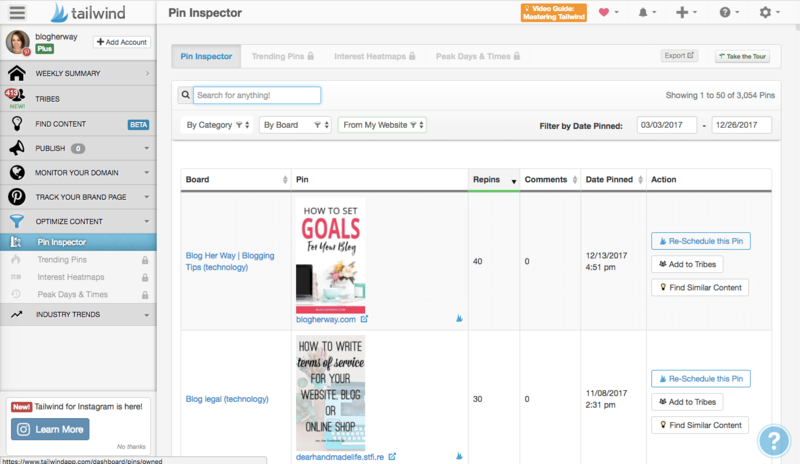 Pin inspector is another analytics feature that gives you insight about the pins from your website. Pin inspector gives you information about how many repins you have for a particular pin. One tactic for scheduling your pins is to schedule your most popular content (content that is already doing well with high repins) and reschedule it to your group boards. Click on reschedule and select the board list you created for your group boards and use interval scheduling to space it out. Before pinning content you will want to install the browser extension for tailwind. This allows you to schedule pins from anywhere using Tailwind. The browser extension adds the tailwind icon to your browser’s bar making it easy to schedule content when you are browsing the web. When you are on a website and you scroll over an image the tailwind icon will appear in the bottom left hand corner of an image. You can click on the icon and it will pull up the tailwind window allowing you to schedule a Pin to your Tailwind queue. Finally it adds the tailwind icon directly in the Pinterest platform to make it easy to schedule content when browsing Pinterest. Tailwind tribes is a great way to find other people’s content to share to your boards. With a tribe you can add your content and it will show up in the tribe’s main feed. Each tribe will have its own rules set up by the tribe owner. Generally it is best practice to re-share more content than you add to a tribe. There are two types of tribes you might join. First a tribe by association is one where you join a tribe based on who you know. It may be a group of friends and fellow bloggers, where you want to actively support each other by sharing each other’s content. Sometimes these tribes are not always on topic and not every pin is ideal for your audience. 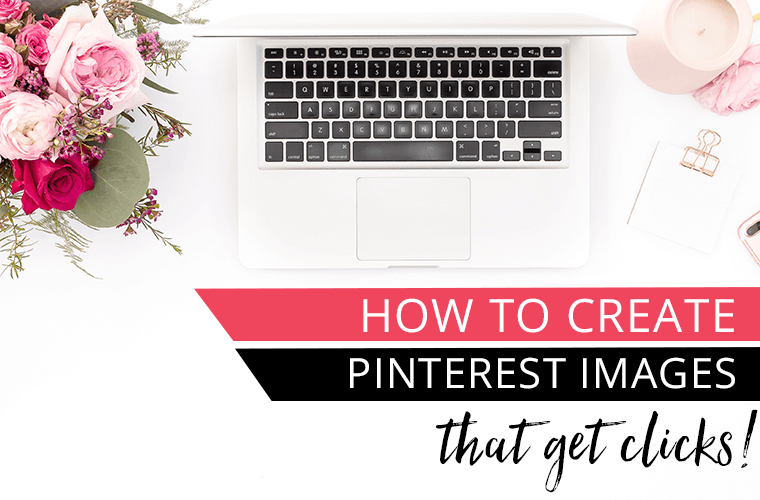 I find that if you have to scroll multiple times before finding a relevant pin to share then it is not the best tribe especially when you want to spend the least amount of time possible to schedule out your Pinterest. The second type of Tailwind tribe you can join is a tribe based on topic, which involves joining specific tribes in your niche. Generally most of the pins are in line with the content you share. This type of tribe is ideal to help you find great content to share quickly. One great feature about Tailwind tribes is you don’t even have to have a paid account to join. For non paid accounts you are more restricted in how many tribes you can join and how many pins can be added to your tribes, but you can still reap the benefits of this great feature. Check out these 7 powerful tailwind features to help schedule Pinterest quickly and efficiently! 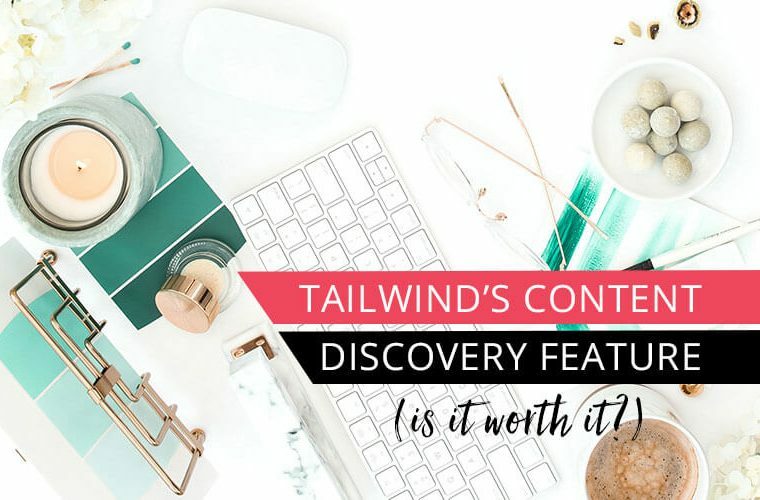 Tailwind’s content discovery feature is currently in Beta testing and you have to specifically request this feature to be added to your account. This is an extra feature that has an additional monthly cost. Check out my review where I show you how to use this feature and find out whether I think it is worth it or not. Add your favorite sites by selecting their RSS feed. It will show you a collective feed to easily share from your most visited sites which you can easily filter by most recent, trending or most popular. 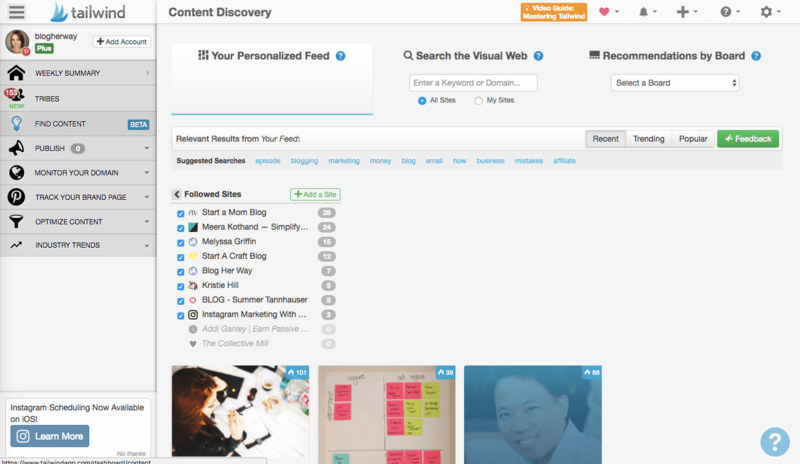 Content discovery adds a search feature when you can search your feed or the web by keyword. Tailwind is a great Pinterest scheduling tool that allows you to save time when scheduling pins for your blog. Bonus feature: content discovery makes it easy to find content from your favorite sites or find recommend pins by specific keywords or by board title. Let me know in the comments below what is one of your biggest struggles when it comes to Pinterest? Don’t forget to Pin and SAVE this post for later! These are great tips! I never really knew about the pin inspector one. Also, the virality score i see on tailwind, is that for the entire group or would it be for me? Thanks! With board insights you can look at your personal boards and group boards and the virality score looks at the health of the board as a whole which includes your pins and other people’s pins. The best tool ever for managing the Pinterest is http://PinPinterest.com and there are no second thoughts about it. After using it for 4 months now, I must say, it has contributed a lot in adding the followers and boosting my earnings too. Firstly, it is absolutely amazing investment especially when it comes to the artificial intelligence that it uses to pin the relevant items, find and show the right content which will be popular with my target audience. And to top it all, the great help it offers in scheduling the pins automatically and what I need to do is just feed my preferences once a week and it does the rest of the job. I love that I don’t have to create multiple PinPinterest accounts to manage multiple Pinterest accounts. I can manage them all at one place. Ciara thanks for the suggestion! 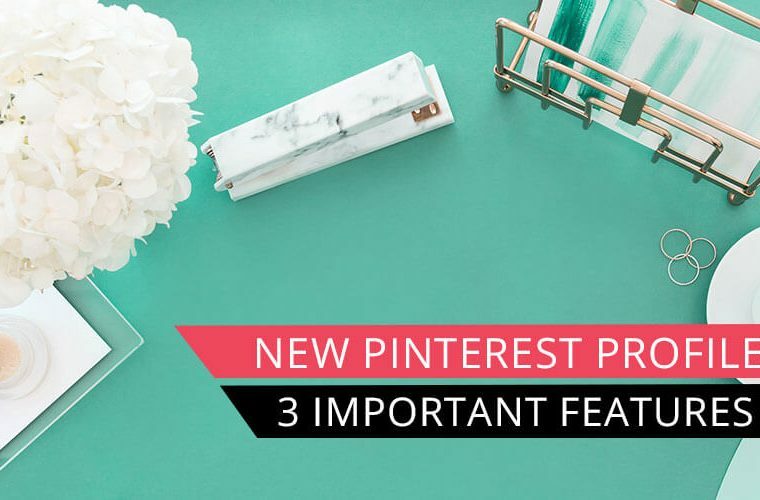 I love hearing about new Pinterest tools I will have to go check it out! I just started out on Pinterest, so this post is of great help. Thanks for sharing. John, I’m glad you found this post helpful! Pinterest is definitely a long term strategy so just start from the beginning and keep working at it!